Sidney’s Ben Spangler swings at a pitch during a Greater Western Ohio Conference American North Division game on Tuesday in Troy. 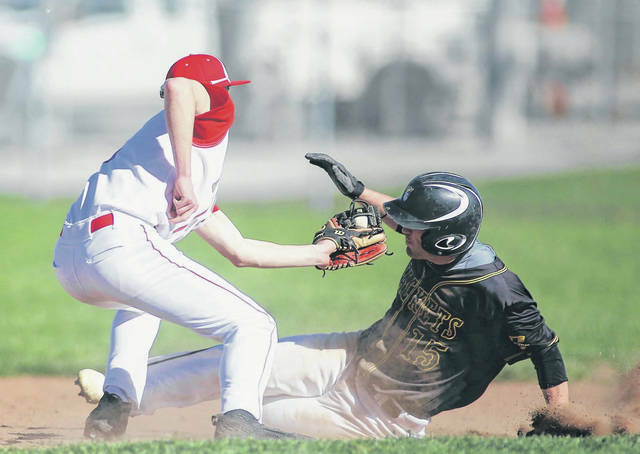 Sidney’s Caleb Harris is tagged out by Troy’s Austin Kendall while attempting to steal second base during a Greater Western Ohio Conference American North Division game on Tuesday in Troy. TROY — Troy’s baseball team dealt with enough drama in Monday’s series opener at Sidney. So the Trojans made sure there was none on Tuesday. After a stressful and narrow 4-3 victory on Monday to begin the Greater Western Ohio Conference American North Division series, Troy sent 21 batters to the plate in the bottom of the first alone Tuesday against Sidney, scoring 13 runs before the second out had even been recorded and finishing with 16 runs before the Yellow Jackets’ second chance at the plate in a 17-2 victory at Market Street Field to complete the two-game sweep. There was plenty of drama Monday as Sidney battled back to tie the score at 3-3 with a three-run bottom of the sixth, only to have Troy retake the lead in the top of the seventh and close it out in the bottom of the inning with the potential tying run on third base. On Tuesday, there was no doubt from the beginning. Troy’s offense was on fire from the start, with Austin Kendall singling to lead off and Caleb Fogarty walking, followed by an RBI single the other way by Jacob Adams. After a double steal put runners on second and third, Braeden Snider hit an RBI groundout that made it a 2-0 game. It would be a long time before the Jackets recorded another out. Brogan walked and then Ethan West ripped an RBI single to left, then another double steal and a hit-batter loaded the bases. A wild pitch scored another run, and another walk sent Sidney making a call to the bullpen with the bases still loaded. Weston Smith was hit by a pitch to bring in one run and Kendall walked to bring in another, then Fogarty drove a two-run double over the center fielder’s head to make it an 8-0 game. Adams followed with a two-run single to make it 10-0 and advanced all the way to third base on the play to the plate, then Snider hit an RBI single to bring home Adams, and a walk and another hit-batter reloaded the bases, forcing Sidney to call on the bullpen again — still only with one out. Sam Shaneyfelt promptly greeted the new pitcher with a two-run double to center, then two straight walks brought home another run before Kendall hit an RBI sac fly to left for the second out in the inning. Fogarty hit one more RBI single to make it a 16-0 game before Sidney finally got out of the inning. The first inning took 45 minutes to play, with the rest of the game taking 45 minutes to complete. And after all of that offense, Troy’s defense was a little shaky in the second inning. Ben Spangler reached on an error to lead off, Lathan Jones singled and Trey Werntz reached on an error to load the bases with no outs. Brogan got a pair of called third strikes and looked like he would get out of the inning with no damage, but Mitch Larger hit a two-out, two-run single to get Sidney on the board, trailing 16-2 after two. Fogarty added an RBI double in the bottom of the third to make it 17-2, and Brogan did the rest. The senior retired the final 10 batters he faced, striking out 10 — six straight at one point — and allowing no earned runs on two hits and one walk. The Raiders picked up their first Shelby County Athletic League win of the season in a slugfest on Tuesday in Russia. The Tigers scored eight runs to take an 8-0 lead but Russia pulled within 9-8 in the third and took control with seven runs in the third. The Raiders had 15 hits and four errors while Jackson Center had 11 hits and six errors. Will Sherman and Carter Francis were both 3 for 5 for Russia with 3 RBIs and two runs. Sherman had two doubles. Jordan York, Grant Saunders and Aiden Shappie each had two hits for Russia. Shappie had 3 RBIs and York and Saunders each had 2. Shappie, who also drew two walks, scored a team-high four runs. Grant Saunders earned the win for Russia. He gave up two earned runs on three hits and five walks in 4 1/3 innings and struck out four batters. Jacob Francis was charged with the loss for Jackson Center. He allowed five earned runs in two innings on six hits and five walks. He had five strikeouts. Francis, Christopher Elchert, Aidan Reichert, Jacob Vetter and Trent Platfoot each had two hits for the Tigers. Vetter and Elchert both had 2 RBIs and Francis scored a team-high three runs. Vetter hit a double. 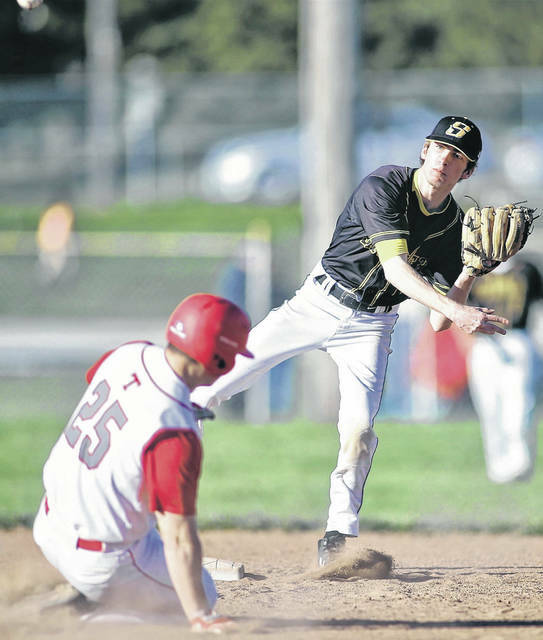 The Cavaliers picked up a run-rule win over Upper Scioto Valley in Northwest Central Conference play on Tuesday in Sidney. They took control by scoring eight runs in both the first two innings. RJ Bertini, Mikey Rossman and Jacob Trent each had one double while Seth Roe had two. Roe and Bryce Kennedy each had three hits. Roe picked up the win on the mound. He pitched three innings and gave up one earned run on two hits and one walk. He had eight strikeouts. The Cardinals took control with four runs in the fourth inning and then fought off a Versailles rally the rest of the way to win a home Midwest Athletic Conference game on Tuesday. New Bremen had four hits and two errors while Versailles had two hits and four errors. Versailles had three errors in its disastrous fourth inning, two of which came on plays New Bremen scored runs on. Mitchell Hays hit a two-run double after the errors to extend the lead to 4-1. The Tigers scored a run in both the fifth and seventh. Ryan Bertke picked up the win for the Cardinals. He allowed one earned run on one hit and seven walks in 4 1/3 innings and had 10 strikeouts. Zach Griesdorn was charged with the loss. He didn’t allow an earned run in five innings and had four walks and two strikes. The Pirates gave up three runs on three hits, three walks and a hit batter in the seventh inning and lost in a Northwest Central Conference game on Tuesday in Lima. Perry had 10 hits and four errors while Riverside had seven hits and three errors. Riverside scored three runs in the first and led 5-0 heading into the fifth. The Commodores scored three runs in the fifth before rallying to win in the seventh. Harley Asbury pitched a complete game for Riverside. He allowed five earned runs and had three strikeouts and three walks. Kale Long was 2 for 4 for Riverside with 1 RBI. He hit a double, as did Zane Rose. RJ McGowan led the squad with 2 RBIs and Levi Godwin scored a team-high two runs. The Trojans lost a home nonconference game on Tuesday. 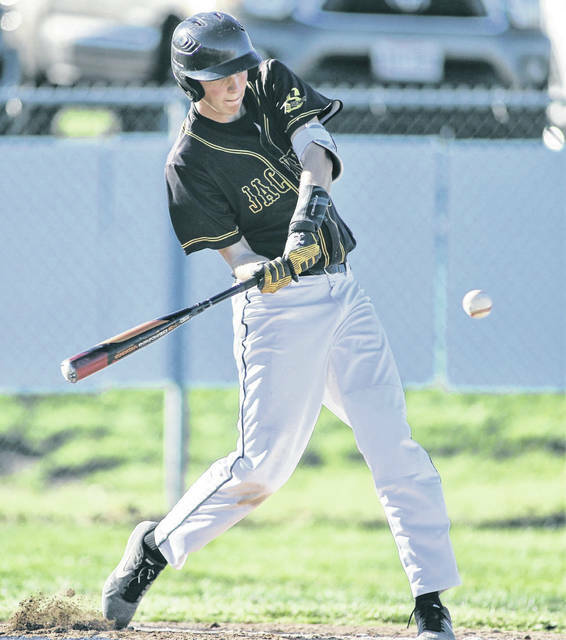 The Raiders picked up a Shelby County Athletic League win in five innings on Tuesday in Russia. Russia had 23 hits and three errors while Jackson Center had five hits and one error. Shea Borchers was 4 for 4 with 4 RBIs and three runs. She hit a double. Morgan Wenrick was 4 for 5 with 3 RBIs, Olivia Moorman was 3 for 3 with three runs, Riley Hammonds was 3 for 4 with 4 RBIs, Jenna Cordonnier was 3 for 4 with three runs and Ava Daniel was 2 for 3 with two runs. Morgan Wenrick picked up the win in the circle. She pitched a complete game and gave up two earned runs. She had one strikeout and one walk. Grace Woolley was charged with the loss for Jackson Center. She gave up 16 earned runs on 17 hits and five walks in three innings. Regan Davidson was 2 for 4 for the Tigers while Riley Jackson hit a double. The Cavaliers picked up a victory in Northwest Central Conference action on Tuesday in Sidney. Lehman trailed 7-4 after three innings but scored one run in both the fourth and fifth innings and then ran away with four runs in the sixth. Grace Brandt was 2 for 4, Grace Monnin was 3 for 4 and Anna Cianciolo and Hope Anthony each had two hits. Monnin hit a double and a home run. Annie Stiver earned the win on the mound. She had six strikeouts and two walks. The Trojans lost a nonconference game in run-rule fashion on Tuesday in Botkins. Allen East had 16 hits and two errors while Botkins had four hits and six errors. Courtney Sutton was charged with the loss in the circle. The Wildcats picked up a home Midwest Athletic Conference win on Tuesday. They had nine hits and one error while Fort Recovery had two hits and three errors. Jenna Poeppelman picked up the win. She pitched a complete game and had nine strikeouts and two walks. Kaitlyn Wolf was 3 for 3 with 4 RBIs for Minster. Taylor Homan was 2 for 3 with 1 RBI and Lindsey Albers was 2 for 3. Wolf had two doubles and a triple and Homan had a double. The Tigers scored six runs in the bottom of the sixth inning to take the lead and stopped New Bremen from coming back in the seventh in a MAC game on Tuesday in Versailles. The Cardinals scored two runs with two outs in the seventh but Erin Smith hit into a groundout to end the game. Versailles took advantage of three hits, two walks, a hit batter and one error in the sixth to string together six runs. The Tigers had 15 hits and four errors while New Bremen had 16 hits and three errors. Lauren Monnin was 3 for 5 with 2 RBIs for Versailles and hit a home run. Hannah Barga, Tara Fritscher, Eli Morris and Abby Stammen each had two hits. Barga, Morris and Stammen each had one double. Morris had a team-high 3 RBIs and Stammen scored a team-high three runs. Monnin picked up the win in the circle. She pitched a complete game and allowed 11 earned runs and had three strikeouts. Molly Smith was charged with the loss for New Bremen. She gave up eight earned runs on 11 hits and one walk in 3 1/3 innings. Smith and Kelly Naylor were each 3 for 5 at the plate. Naylor had 3 RBIs and Smith scored two runs. Abbi Thieman was 3 for 4 with 4 RBIs, Kira Bertke was 2 for 4, Erin Smith was 2 for 5 and Ashton Heitkamp was 2 for 2. The Pirates earned an NWCC win in run-rule fashion on Tuesday in Lima. Riverside closed out the victory with five runs in both the fourth and fifth innings. Jalynn Stanley pitched a no-hitter for Riverside. She had 11 strikeouts and two walks. The Pirates had 12 hits and one error while Perry had 10 errors. Stanley was 2 for 3 with a triple and 4 RBIs. Courtnie Smith was 2 for 4 with 3 RBIs, Sierra Snow was 3 for 3 and Kalin Kreglow was 2 for 4 with 2 RBIs. Russia swept the Fairlawn Invitational on Tuesday. The Raiders’ boys squad finished first with 87 points while the girls team was first with 115. Botkins’ boys finished second with 82 points. Houston was third, Fairlawn was fourth and Jackson Center was fifth. Russia’s Jason Siefring was first in the 110 hurdles in 16.86 seconds. Jonathan Bell was first in the 3,200 run in 11:37 and Michael York was first in shot put with a throw of 44-1.5. Max Bohman was first in pole vault by clearing 11-6. Jason Siefring was first in long jump with a leap of 18-5. Botkins’ Marcus Lee was first in discus with a throw of 116-9. Houston’s Tristin Freistuhler was first in the 1,600 run in 4:51 while Wesley Jester won the 300 hurdles in 46.46. Ethan Knouff was first in the 800 run in 2:03. The Wildcats won the 3,200 relay in 8:59 and the 1,600 relay in 3:38. Houston’s girls finished second with 97 points. Fairlawn was third, Botkins was fourth and Jackson Center was fifth. Russia’s Becca Seger was first in the 800 run in 2:28 while Ella Hoehne was first in high jump in 4-6. Sarah Pinchot was first in pole vault by clearing 10-0. The Raiders won the 3,200 relay in 10:26. Houston’s Hollie Voisard was first in the 1,600 run in 5:50. The Wildcats won the 1,600 relay in 4:39. Fairlawn’s Abbey Swearingen was first in the 100 meter dash in 14.47. Madison Huelskamp was first in long jump with a leap of 15-5.5. The Jets won the 800 relay in 2:01 and the 400 relay in 56.97. Botkins’ Adriana Jutte was first in the 100 meter hurdles in 16.64, first in the 300 hurdles in 48.27 and first in the 200 dash in 27.10. Emma Koenig was first in the 3,200 run in 12:23. Grace Homan was first in discus with a throw of 131-8 and first in shot put with a throw of 38-11. Jackson Center’s Morgan Huber was first in the 400 dash in 1:08. The Yellow Jackets earned a victory in a Greater Western Ohio Conference crossover match on Tuesday in Riverside. Prem Dev won 6-1, 6-1 at first singles while Grant Hoying won 6-1, 6-1 at second singles and Akansh Mani won 6-1, 6-1 at third singles. Broc Bey and Jersain Brux lost 6-4, 6-4 at first doubles and TJ Leonard and Nobel Zhou lost 6-2, 6-1 at second doubles.